In the desert southwest, many native peoples lived in pueblo communities. This painting by artist George Nelson shows how everyday life might have been at Firecracker Pueblo near what is now the city of El Paso. 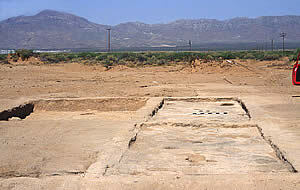 Archeologists excavated the buried remains of large rectangular rooms at Firecracker Pueblo in El Paso. Click to enlarge. Indians living in far west Texas did not have access to tall grasses for thatch or buffalo hides to cover their homes. What they did have was dirt, rock, and straw and, with these materials, they made their adobe houses in communities called pueblos. 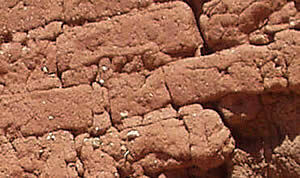 Adobe is mud and straw mixed together and dried to make a strong brick-like material. Pueblo peoples stacked these bricks to make the walls of the house. Gaps between the bricks were filled with more mud to block the wind, rain, and to keep out bugs and other unwanted pests. Indians of the southwest made bricks out of dirt and straw and dried them in the sun to build their pueblos. Over time, rain and wind would cause the bricks to "melt" away. Wooden posts inside each room supported the roof which was covered with layers of sticks, then grass, mud, and finally plaster. Pueblo peoples plastered their walls and floors and often painted them with red, yellow, white, and black bands. Some pueblos were very large with more than 100 rooms! The rooms were built in long rows and could house many families. Most pueblos had large underground rooms called kivas that were used for ceremonies and meetings. Structures made of adobe would not stand up to long periods of rainover time they would dissolve! Adobe homes were only built in the very dry parts of West Texas, New Mexico, Arizona, Utah, Colorado, and Mexico. Puebloan peoples made beautiful decorated pottery. This jar and bowl were found by archeologists excavating Firecracker Pueblo. Click to enlarge. Just outside El Paso in far west Texas, archeologists uncovered the remains of a large pueblo built around 500 years ago. The archeologists named it Firecracker Pueblo because of a firework stand nearby. Firecracker had more than 15 rooms. Most rooms had hearths or fireplaces near the center of the south wall. The largest room is probably a communal or meeting room and had two hearths and rows of small pits used for storage.